Sheffield Sharks continued their climb up the BBL Championship with victory over BBL Cup finalists Glasgow Rocks. Sharks, runners-up last year, have won three in a row in the league, but last week went out of the Cup at the semi-final stage for a third year in a row. But, even without star point guard BJ Holmes, they overpowered Rocks 69-55 to move into the play-off positions. There were also wins over the weekend for London, Newcastle, Leicester, Plymouth, Cheshire and Manchester. 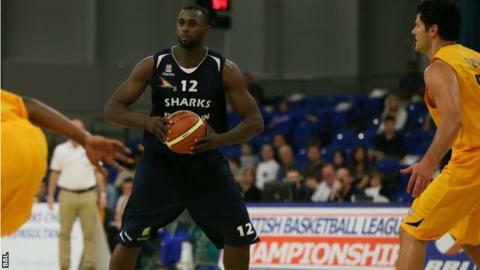 "We feel good about beating a well-coached Glasgow team," said Sharks forward Olu Babalola, who scored 17 points in the victory. "But we have a lot more room for improvement and that's no good unless you know specifically what needs improving, which we feel we know, so we're working on it." Newcastle Eagles stretched their incredible winning run to 14 league games with successes against Leeds Force and Manchester Giants as second-placed Worcester Wolves slipped up, beaten by London Lions. Cheshire Phoenix capitalised, moving level on points with Worcester, by holding off Lions on Sunday with to 25 points and 12 rebounds from Demond Watt, for an eighth straight win. Surrey United suffered two defeats, beaten by Leicester Riders and Plymouth Raiders, with Ben Mockford and Jordan Clarke enjoying winning debuts for the Raiders. Giants responded to Friday's defeat with an important win against Play-off rivals Durham Wildcats on Sunday, leapfrogging their opponents into the play-off places, but more importantly claiming the head-to-head tie-breaker over their opponents, having now won two of their three meetings this season. Meanwhile, the line-up for the WBBL Trophy final was confirmed as Nottingham Wildcats beat Sevenoaks Suns while Sheffield Hatters booked their place with victory against Leicester Riders. Lauren Thomas Johnson, Steph Gandy and Helen Naylor combined for 58 points as Hatters won an eighth game in a row.